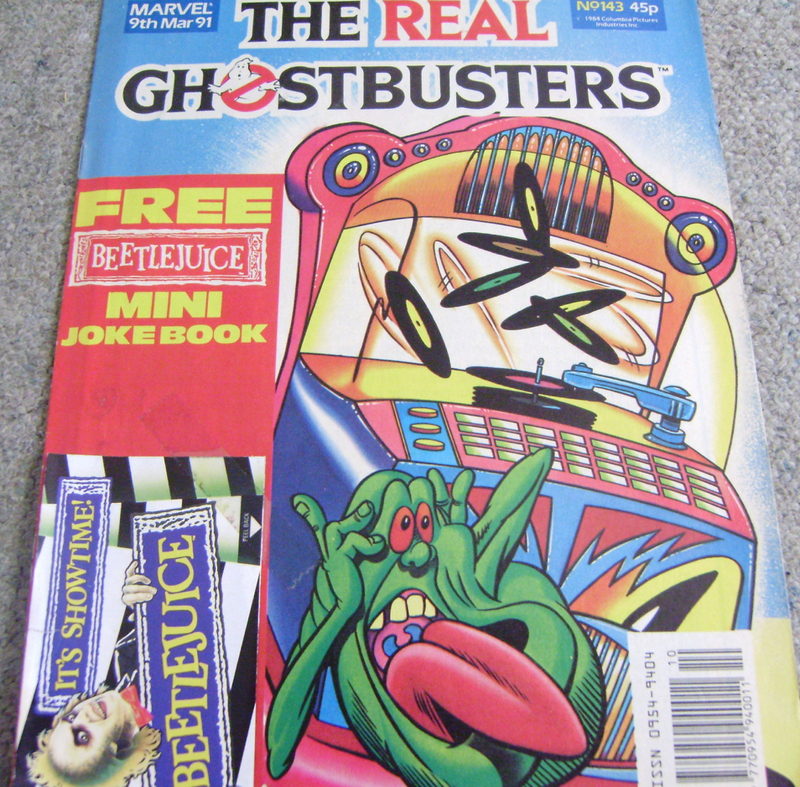 Today I’m going to mosey back down memory lane and share some images from my old Ghostbusters UK comic collection, specifically focussing on the VERY rare examples that still feature their original cover mounted free gifts. To understand just why it’s so difficult and unusual to find issues like these you have to consider several things. First of all, comics in the UK during the 1980s and 90s were TOTALLY aimed at young children, in every way possible. They were bright, thin, fragile, disposable and simply not designed to survive the test of time or be collectable at all. Many were delivered to homes rolled up with the daily newspaper (mine were), and as you can probably imagine, if a young kid sees a cool free gift taped to the cover of their latest comic what’s the first thing he or she will do?? … Yup, rip it off and play with it! 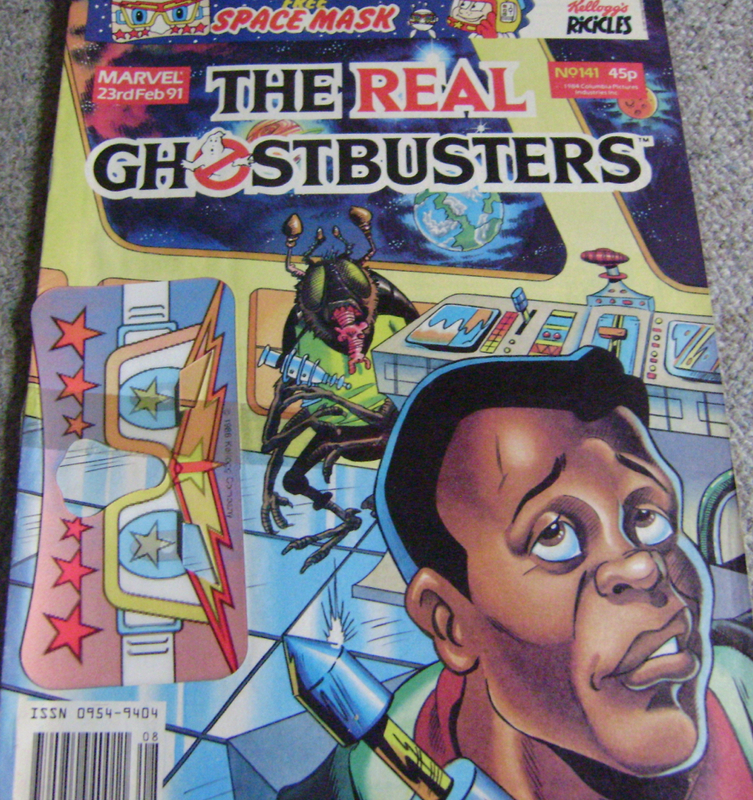 You also have to consider that these comics were published long before the internet, ebay and comic speculation fever existed, they were just floppy reading material for kids. You flipped through them, enjoyed them, then your parents either threw them in the trash, stuffed them under your bed or, in my case, stacked them in a scruffy box in the corner of your bedroom. I’d love to be able to say that the issues I am going to talk about today were mine from the day they were released, but I was just as guilty of mistreating them as everybody else. These copies have been purchased by me via online auctions and from fellow collectors over many years. I’m madly passionate about Ghostbusters and it’s become a bit of a disturbing obsession and mission to try and photograph a complete set in high grade condition with EVERY free gift still accompanying the issues they came with. 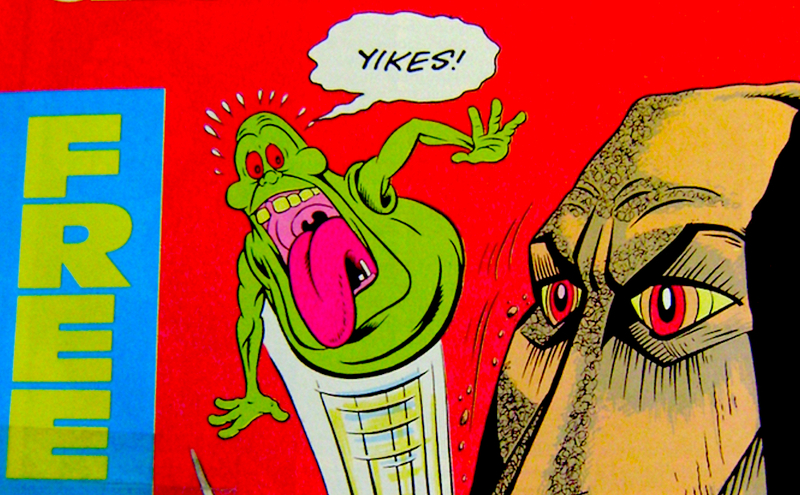 Saving images for posterity and to be able to share them with Ghostbusters fans from around the world. Future generations NEED to know about this stuff DAMN IT!!! We start with issue 28, proudly announcing that it comes with a “Free Willow Model” and by model they actually mean two tiny pieces of foam with pictures printed on them. These magnificent, highly detailed “models” could also be found within boxes of Kellogg’s cereal that were on sale at the time, so some bright spark must have decided that a cross-promotion with Marvel UK comics would be a good idea. And let’s be honest, Willow was a fantasy movie starring Val Kilmer … it needed all the help it could get! 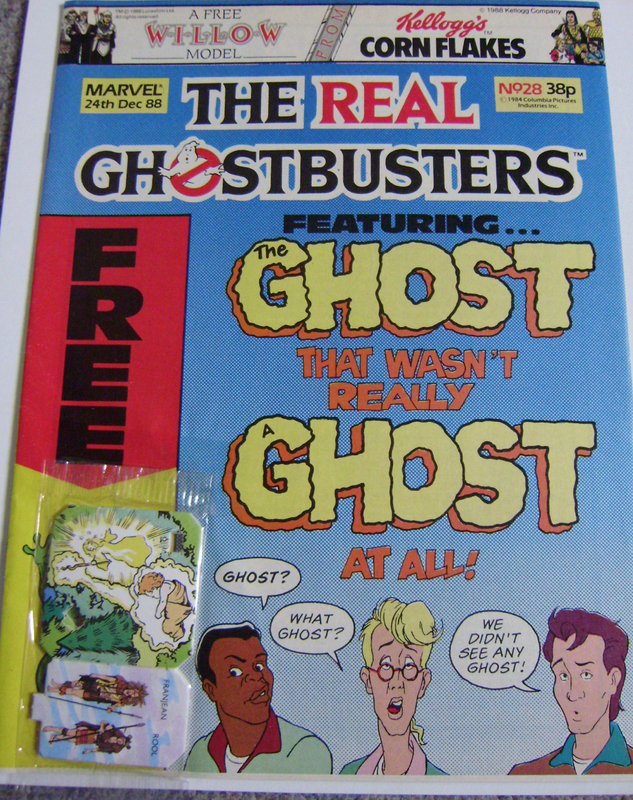 Next we travel forward a few weeks to issue 41, and things have taken a turn toward the yummy-side with a free Jelly Ghost taped to the cover. 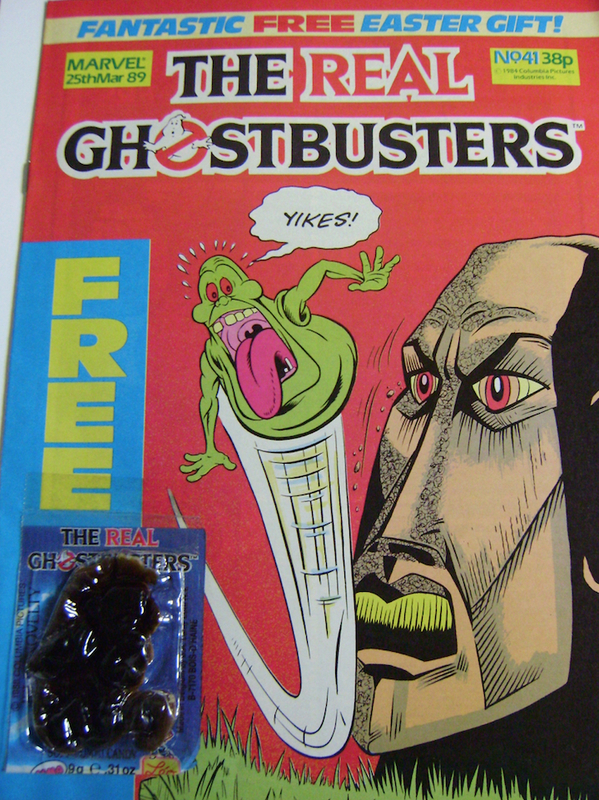 I know what you’re thinking, is that actually a nearly 26 year-old jelly candy still taped to that comic? Of course it is! How awesome is that!! The plastic around the edges is starting to crack, and the jelly inside has turned powdery and solid while also taking on a strange dark brown appearance (I’m sure it wasn’t made that color), but I must say it still smells great! This is a perfect example of what I mentioned above. Who the hell keeps a comic like this in such good condition? Were the kids allergic to candy? Whatever the reason I will forever give praise to the original owner of this magnificent specimen. One day I might get brave (or drunk) and create a youtube video featuring me eating this! Zooming way ahead to issue 141 we find that Kellogg’s have returned to shower unsuspecting readers with more totally unrelated fluff. This time it was a lenticular Space Mask! The makers were kind enough to cut a hole for your nose but apparently didn’t think the ability to see was all that important. I’ve worn my original space mask back in the day and I can confirm that the small holes situated where the eyebrows should be are not suitable for maintaining good vision. At least you can smell stuff as you walk into the nearest door! Next we come to the landmark 150th issue, and they celebrated in style by including a (drum roll) … FREE BOOK MARK! It was cheap and floppy but the film-strip style was pretty cool and I do remember being very impressed with this item as a kid. 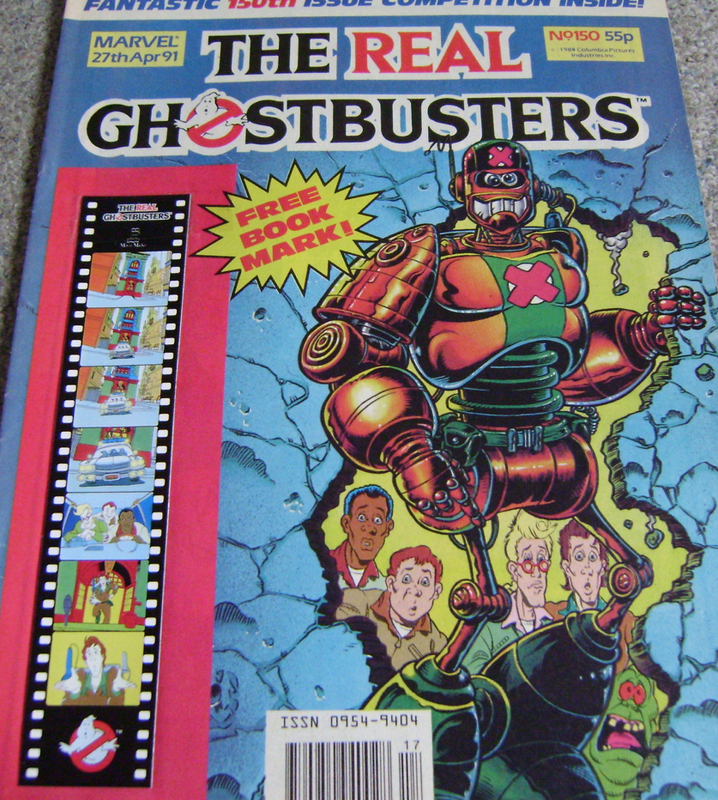 Any gifts that were actually linked to the Ghostbusters in some way were always welcome and this one was worth keeping. I’ll finish for today with probably my favorite gift they ever gave away. Not because it was the best, it certainly isn’t that! But simply because at the time I found it SOOO cool. A tiny little booklet was taped to the cover of issue 143 which they called a Beetlejuice Joke Book but if memory serves it was more of a promotional toy catalog with a few jokes included to fill space. At that age I was MAD about Ghostbusters and worshipped Beetlejuice, so bringing them together like this was printed heaven. I loved that little pamphlet … it was a dark day when I realised I had lost it in my classroom. A dark day indeed. I’ve only scratched the surface with this list, but hopefully I have started to reveal just how strange and wonderful the glory days of Marvel UK were over here. The comics were fun and the gifts were bizarre, but they are all worth remembering.